Duen Ngai, Kalohom and Khromata (The first progeny in 1905). Health & Disease, Author: Frank Townend Barton 1908 Everett & Co. The Siamese is considered to be one of the oldest of the Oriental/Asian cat breeds, and it is believed that the origins of Siamese cats originated from Thailand, formally known as Siam. This ancient Asian land is the source of the breed’s name and its more flattering, legendary reference, “The Royal Cats of Siam”. Known as Royal Points, these cats were honored in such high regard that no one except the king and members of the royal family were permitted to own them. There seems to be some mystery on how the Siamese made it into Western Culture. The Siamese is also (arguably) the most recognizable breed on the planet. This feline is considered by many to be a “natural” breed, one that developed without the interference of man. Pictures of a Seal Point appeared in the manuscript “Cat-Book Poems”, written in Siam (now Thailand) sometime between 1350 and 1700. 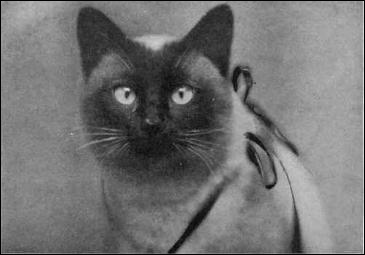 Early stories and myths involving the Siamese are plentiful, including fanciful tales that account for the cat’s physical traits. One such story tells how sacred Siamese temple cats, charged with guarding a valuable vase, curled their tails around the vase and stared at it with such intensity that their eyes became crossed. 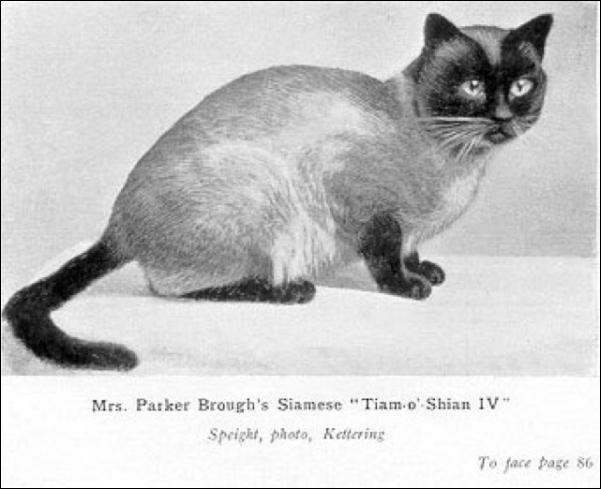 Another storey tells of Siamese cats appointed to guard princesses’ rings: The cats kept the rings on their tails and the tail kinds developed to keep the rings from sliding off. 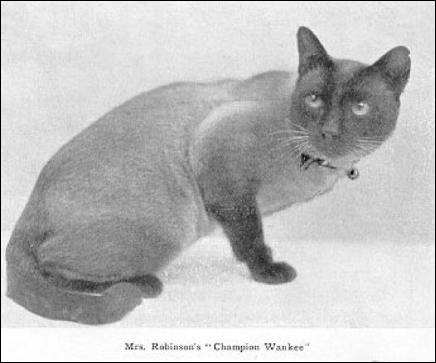 As stated in “The Book Of the Cat”, by Francis Simpson (1903), Adele Locke founded the Beresford Cat Club, and owned the first registered Siamese “Stockehaven Siam”. 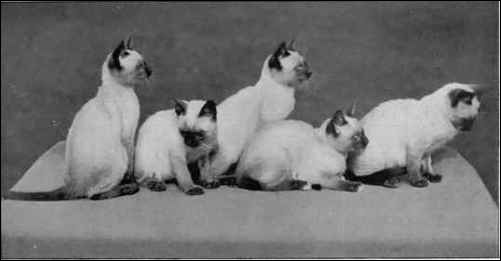 Mrs. Locke owned several Siamese, showed them in cat shows, and was well traveled. 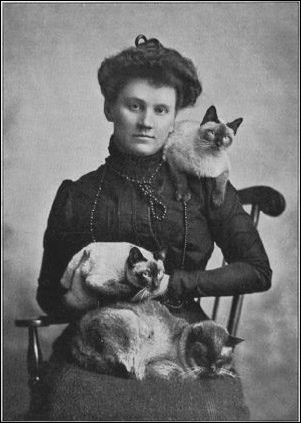 Pictures of her and her Siamese cats can be found online by using her name as a search keyword. In the Siamese world, there are three known and recognized types of Siamese (head/body type and style). There is the Applehead (aka Traditional, Old Style, Original), there is the Classic, and lastly the Wedgehead (aka Show Style, Extreme, Modern). The shape of the Old Style Siamese head is the most important feature of the cat. 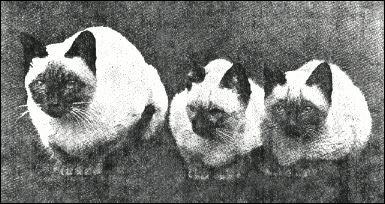 Old Style Siamese breeders refer to these cats as Applehead Style, therefore the shape of the head is that of an apple, round preferred but oval is acceptable, with no evidence of a wedge shaped head. The muzzle enhances the roundness of the head. The length and width of the muzzle is wider than long, neither pointy of blunt. In profile, the nose has a gentle dip, located at eye level. The ears are medium in size, broad at the base with rounded tips. They are set as much on the top of the head as on the side and are tilted forward. The top eyelid is slightly slanted. 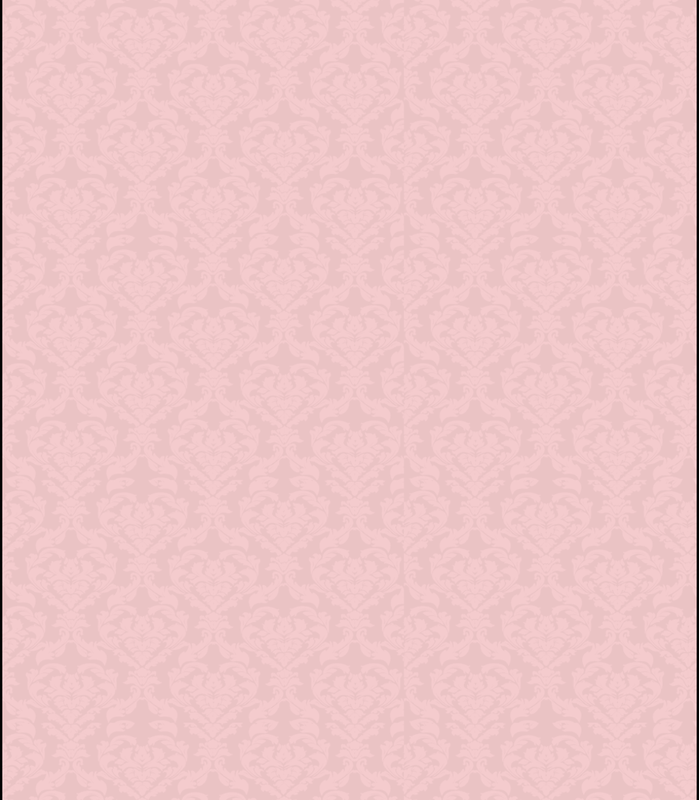 The bottom eyelid is slightly rounded. Eye placement should be an eye width apart. 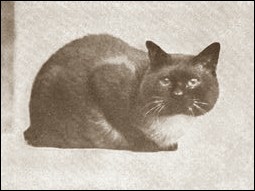 A classic Siamese cat has a moderate wedge shaped head and face, with more definition to the muzzle than the Applehead, with longer legs, and a slimmer, more muscular, strong body. The classic Siamese coat is smooth and lies flatter and tighter to the frame that that of the Applehead, but it is not as fine and thine as the ‘painted on’ coat observed in the Wedgehead. This cat is also substantial in size compared to the Wedgehead. The ears tend to be larger than the Applehead, but smaller than the Wedgehead’s. The body type is not cobby or thick, but rather Muscular, and toned. The ideal Siamese is a medium sized, svelte, refined cat with long tapering lines, very lithe but muscular. The head is a long tapering wedge. The total wedge starts at the nose and flares out in straight lines to the tips of the ears forming a triangle, with no break at the whiskers. No less than the width of an eye between the eyes. 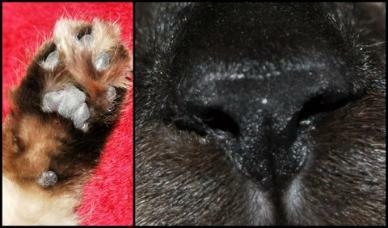 When the whiskers are smoothed back, the underlying bone structure is apparent. The skull is flat. In profile, a long straight line is seen from the top of the head to the tip of the nose. 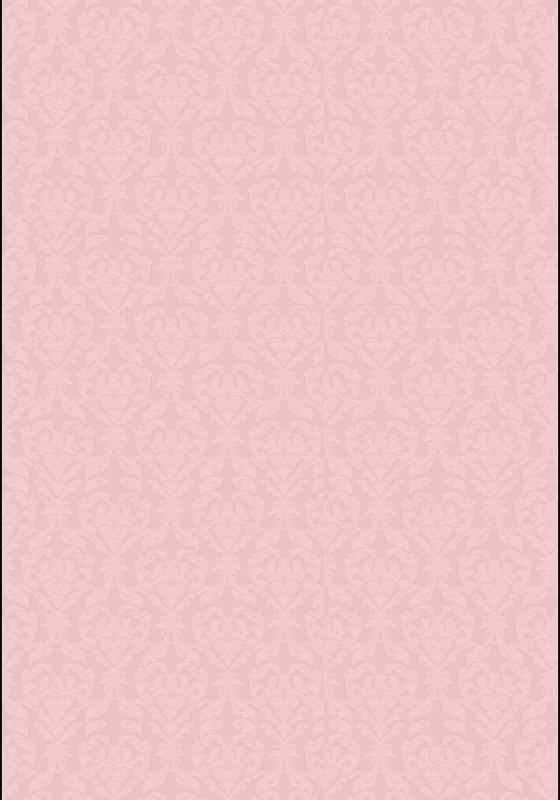 The ears are strikingly large, pointed, wide at base; continuing the lines of the wedge. The eyes are almond shaped. Medium size. Neither protruding nor recessed. Slanted towards the nose in harmony with the lines of the wedge and ears. Uncrossed. The nose is long and straight. A continuation of the forehead with no break. Siamese cats are a very intelligent, lively, and entertaining cat. They can be very demanding and become totally involved in their owner’s life. Siamese do not like to be ignored, and always have to be the center of attention. They usually regard themselves as people rather than cats. You will never be bored if you own a Siamese cat. Siamese cats have a strong personality and are usually very talkative, often developing loud voices. The chattiness of the Siamese can be developed at a young age, by talking to your Siamese and encouraging its vocal abilities. Many youtube videos of talking Siamese can be found today which help give potential owners insight into this personality trait. The Siamese is a talkative cat, vocalizing about a variety of things. They have many different meows and chirps and their owners come to understand the meanings of these sounds. 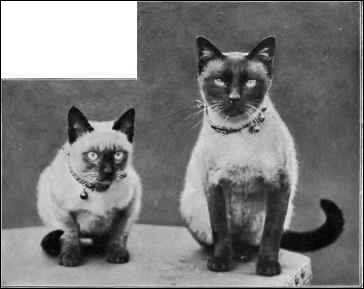 The loud Siamese call, which non-fanciers often think of when they think of a Siamese, is only used when the cat is particularly distressed about something. Each Siamese has it’s own stress tolerance and finds different alarming, as a result some Siamese cats use their vocal calls more often than others. 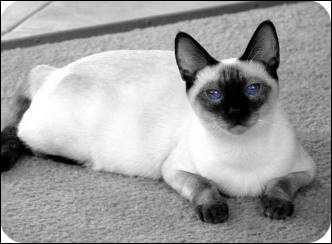 The Siamese voice is quite legendary and they use it well to communicate with humans. Their meow has been compared to the cries of a human baby. 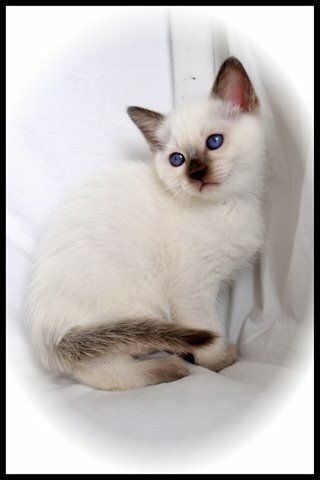 The Siamese enjoy being with people and have a great need for human companionship. Siamese cats are sometimes described as extroverts. They often bond strongly to a single person. Siamese cats are affectionate, and make a wonderful, entertaining and totally dominating pet. They are loyal, loving, intelligent, and vigilant. These cats are typically active and playful, even as seniors. They are a high energy cat who are always on the go. Please do not confuse high energy with destructiveness or hyperactive, they are energetic, not lazy, not psychotic. Whatever activity you are engaged in, you can be sure that your Siamese cat will be right by you, ready to help out. 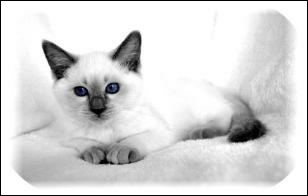 There are four recognized color points in the Siamese breed. They are seal point, chocolate point, blue point, and lilac point. I will describe the color points and show pictures of them as examples. 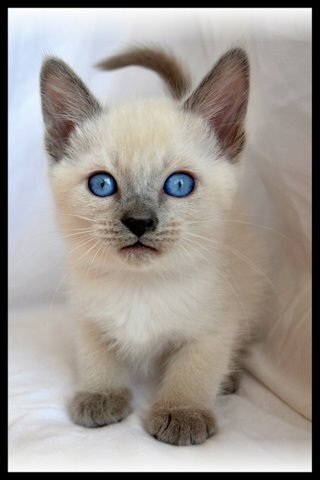 Seal Point Siamese cats have very dark, almost black, seal-brown points, with facial mask, ears, tail, paws, nose flesh and paw pads all the same color. Of all the color points, they have the widest variation in body color. At a young age, they might be a pale cream, but seal points tend to darken and change with age. Although the fur on their chest, neck, and stomach may stay lighter, their backs tend to darken to a warm-toned caramel beige, and may even turn dark brown, so that later in life there may be little difference in color between the hair on their backs and their tails. 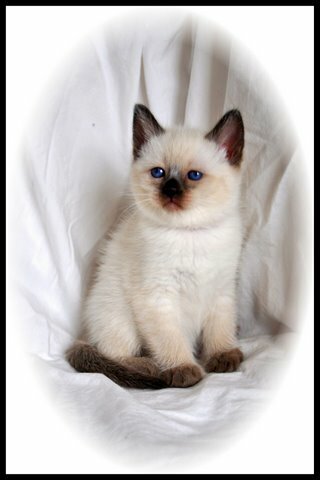 The Chocolate Point generally has ivory-white fur which stays pale throughout their lifetime. This differs from seal points, whose coats tend to darken as they get older. Occasionally though, you may find a chocolate point with cinnamon tones to their coat. This is set off by warm-toned milk-chocolate color points (facial mask, ears, tail, and paws). 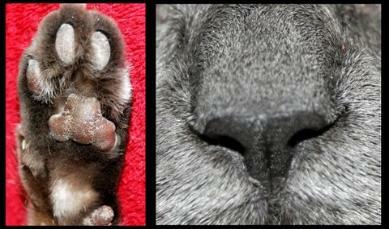 Their nose flesh and especially their paw pads have a pinkish undertone. 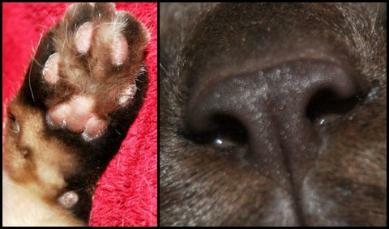 If ever in doubt, this pinkish undertone is a good way of telling a chocolate point from a seal point. Chocolate Point cats are less common than seal points and the kittens develop their coloring much later than their darker seal point and blue point counterparts. The Blue Point is related genetically to the seal point, being a diluted or paler grayish version of the very much darker seal point. It has a cold-toned, deep slate gray bluish points (facial mask, ears, tail, paws, nose flesh, and paw pads), this is all contrasted beautifully by a blush-white body fur which, like that of a seal point which also tends to darken with age. All members of this point color should have this cool toned, white fur, rather than a warm tone. Occasionally you will find Siamese cats with lighter, silvery blue color schemes, rather than the common slate gray color scheme. Lilac Points are the palest of the four color points. They feature pinkish toned, light frosty gray ears, tail, paws. Lilacs are sometimes referred to as frost points if the points are very faint. They are the lightest of the four major breed color points (Seal, Chocolate, Blue, Lilac). 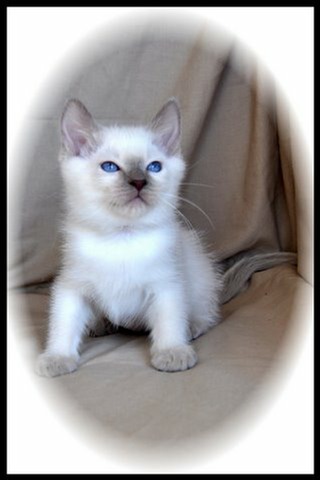 This color point is actually a paler version - what is known by breeders as a dilute - of the chocolate point. 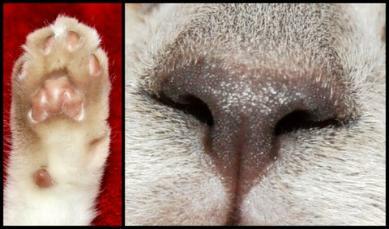 Everything about a lilac point should be pale, from their ears to their paws. Their nose flesh and paw pads have a pale pink undertone and they should have light cream or magnolia colored (not pure white) coats. Which would stay pale white throughout their lives. 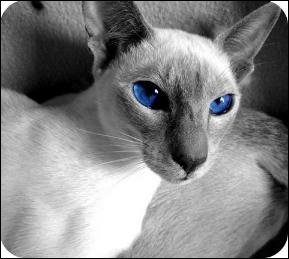 Due to it’s popularity and beauty, the breed has been incorporated into the matrix of many modern cat breeds, including the Ocicat, Himalayan, Burmese, Tonkinese, Ragdoll, Snowshoe, and a myriad of Oriental breed offshoots like the Oriental Short hair, Oriental Longhair, Color Point Short hair, Color Point Long Hair, Balinese and Javanese. 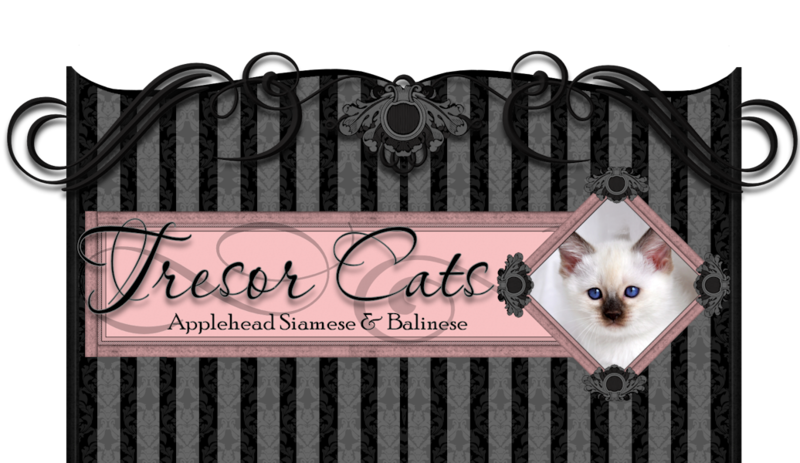 Although the Wedge head Siamese is favored in the show ring as the breed standard, the apple head (aka Old Style, Traditional) has an enthusiastic following of breeders, fanciers, owners who which to perpetuate and preserve the Applehead Siamese breed. As a fancier I believe the Applehead’s rounder, heavier body style is closer to the original type that existed many years ago. These cats can live anywhere from 17 to mid 20’s as long as they are kept indoors, fed a nutritious diet, get routine dental and medical care, and supplemented with vitamins. Love is also a big factor. If you are looking for a cat that will have conversations with you, and keep you entertained, then the Applehead Siamese is the cat for you. The Siamese is great with children, other pets, (i.e. dogs, rabbits, etc. ), and visitors. Socialization skills have to be ingrained from a young age, so if you want your Siamese to love your friends and family, have them feed, give treats, and play with your little Siamese often from the start. There is truly, never a dull moment when you are keeping the company of a Siamese cat.